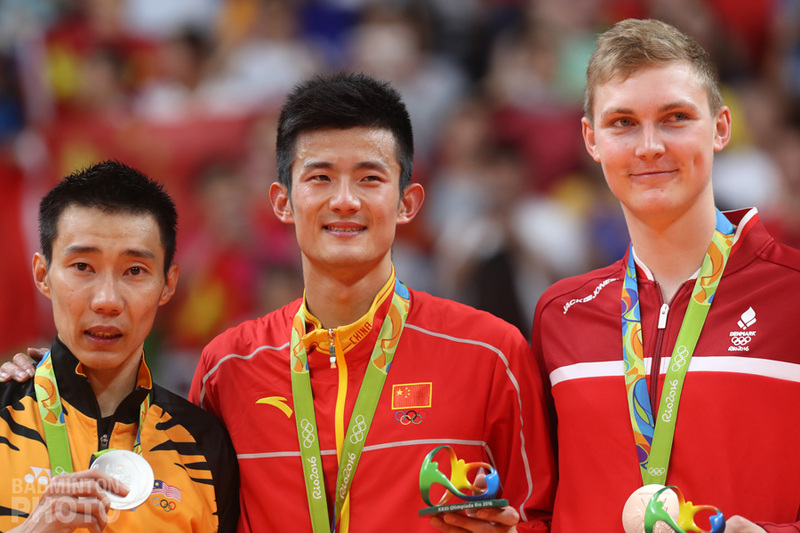 Lin Dan finally got his hands on the last title that had eluded him until now – the Asian Games individual gold medal. He has now become one of the most complete and decorated badminton shuttlers of all times. Olympic Champion, three-time World Champion, Asian Champion, three-time All England champion, and now, Asian Games gold medallist: Lin Dan (pictured left) has it all. He finally got his hand on the last piece missing the collection on Sunday in a packed Tian He Sports Center, against Lee Chong Wei of Malaysia. Both shuttlers had been very cautious about pre-match interviews, each saying his future opponent was the best and that they’d just try their best. But of course, the build-up toward this confrontation was evident for everyone. Between the reigning Olympic champion and the recent Commonwealth champion and moreover world number one. 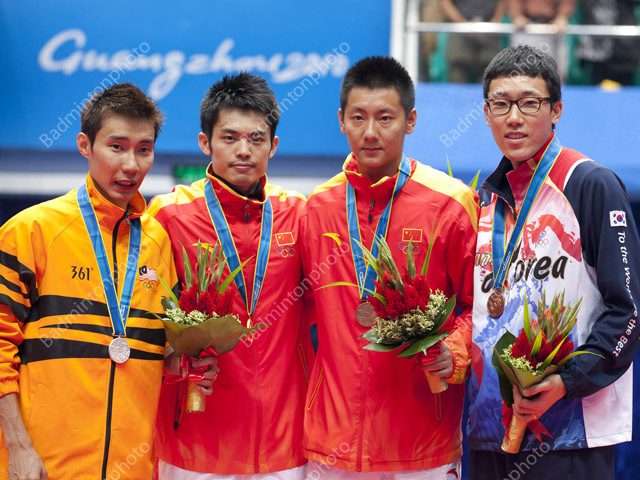 It was made even more tense given that Lin Dan had bowed to the Malaysian in Japan in September, when both players had reached a very high level of play. 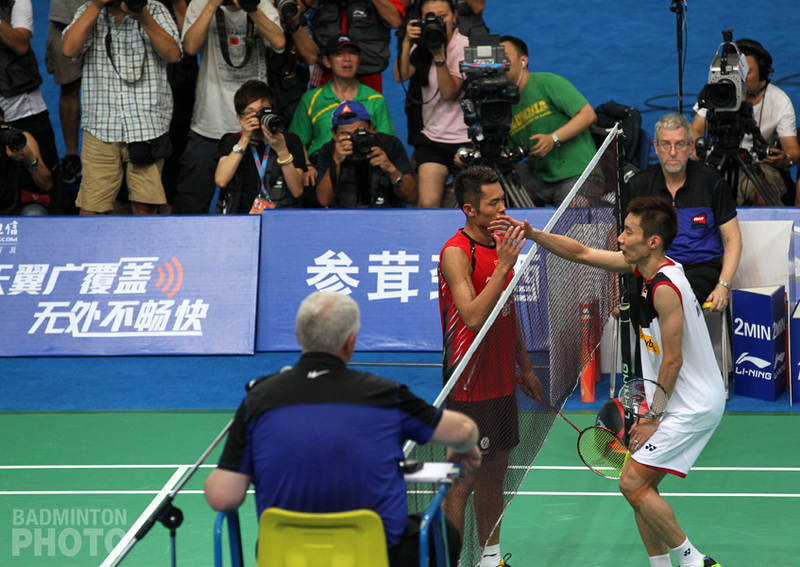 Lin Dan couldn’t blame a bad day in Tokyo as it was just Chong Wei (pictured right) who was better. Of course, that was a Super Series and not exactly at the top of the great Chinese players to-do list. At stake this time was the title that has eluded him, the title Lin Dan wants to be crowned Asian Games champion. So, things were different. But Lin Dan also had in the back of his head that Chong Wei was in a confident mood after that Tokyo win and his good run in Guangzhou, edging out the world Champion Chen Jin in the semi final was sure to have had the Malaysian mentally ready for the fight. The stage was set for the real rematch of the Olympic final and that’s what it was. Similar pressure, similar conditions and the same host country. And for the first game, it looked like it was going to be the same story again. Lin Dan, much sharper – but somehow quieter between points – made his usual “one Dan show” while Chong Wei seemed overwhelmed by his opponent’s attacks. Lin took the first game 21-14, but the second game was to go the other way. The Malaysian, keeping patient and forbidding himself to attack, led Lin Dan to commit some mistakes and led throughout the game until he put all things back to square at one game all with a 21-15 victory. 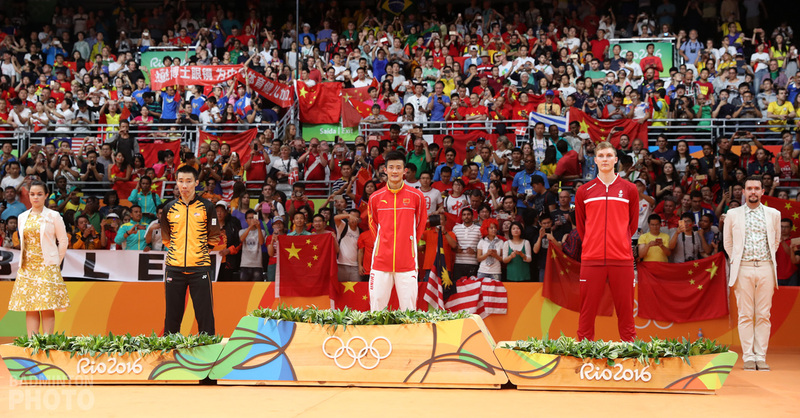 The public now had what they had paid for, a real match and not a badminton lesson given by Lin Dan even if they were hoping for a happy ‘home grown hero’ ending. Lin Dan came back on court faster than ever in the deciding game, even showing some emotion and clenched fists after important points. Some rallies were just incredible, and in spite of leading from the front and opening up a gap of 5 points, the Chinese didn’t let down his guard and chased down every point and one in particular lasted forever. Lin saved the shuttle from hitting the ground on numerous occasions before finally ending the rally to break the resolve of Chong Wei. That rally typified the whole match, were Chong Wei was playing patient and clever but in the end Lin’s will and desire made the difference. Not longer afterward, Lin Dan was celebrating, taking his shirt off just like the good old days, sending his shoes in the crowd, a Lin Dan trademark though this time, not the ones he was wearing but another pair. 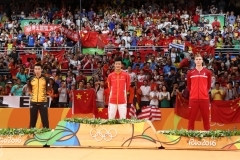 “This is what badminton is about and the sport comes out as a winner of such matches,” said a delighted Lin Dan. “Whoever won or lose, won’t matter, but we made the show today, and I was just lucky to have been able to win, yet I still respect Lee Chong Wei very much,” said Lin Dan in a press conference where Chong Wei was missing. When the usual question popped up about his future potential wedding to Xie Xingfang, the champion was elusive but responded with humour: “It’s funny. Before the competition I was feeling under pressure, and I can now feel relaxed, but your questions about Xie Xingfang now put me under pressure again,” said Lin Dan. “This is a question I need to think about carefully as it is important and I intend to think about it seriously when the time comes. And you’ll be the first ones to know,” he added. Before the big clash of the evening, the 4th individual gold medal was at stake in the mixed doubles event, with two pairs that had never met before: All England champions Zhang Nan and Zhao Yunlei facing Korea’s Shin Baek Cheol and Lee Hyo Jung (pictured below right). 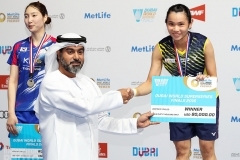 The latter had limited herself to women’s doubles in Doha as she was then recovering from a back injury and there was no chance of her career extending to the next edition, which will be in Incheon, Korea. 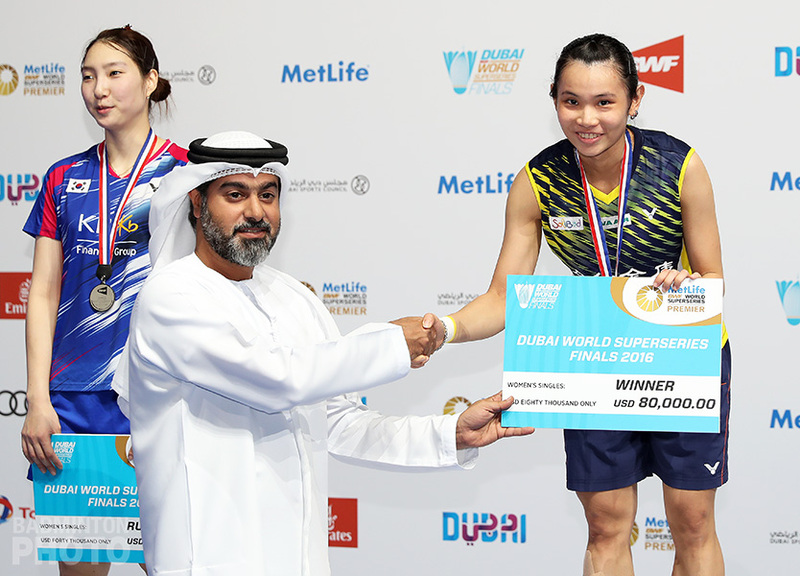 This was her chance to grab one the titles she had hoped for after her Olympic gold quest, which had been fulfilled already with Lee Yong Dae. And, as was evident from the announcement she made after the match, it was clear she had hoped to finish her career on a high note. The first game was very close, with a very tactical part played by the Koreans, who were in the lead most of the time thanks to some clever attacks on Zhang Nan. Both teams stayed neck-and-neck for most of the game when the suspense peaked at 19-19. Shin Baek Cheol then hit an ideally placed smash which touched Zhao’s shoulder, giving the Koreans a first game point. Shin didn’t waver, unlike the previous evening, and the first one was the good one, ending the game 21-19 for Koreans. The second game saw the Koreans take the lead quite early, with some very inspired play by Lee Hyo Jung, who placed their opponents ideally before her partner killed the shuttle, resulting in an 11-7 lead for Lee and Shin. An incredible point at 12-8 saw the Koreans defend for twenty attacks from the Chinese before a magic return from Lee gave them one opportunity to attack. After that, it was a one-sided match, with the Chinese unable to finish the points thanks to amazing defense by the Koreans. One point after the other, the crowd was silenced except for that small Korean party of players cheering in the stands. The last shuttle was called out and Shin Baek Cheol was on the ground, probably not believing what had happened. “I had a dream on the way here to Guangzhou, in the plane, but I didn’t want to talk about it until know as I was afraid it would shatter my dream, but I dreamt that a dolphin came and talked to me, and these words helped me win this gold medal,” said Shin Baek Cheol shyly while his compatriot Lee Hyo Jung was laughing. For Shin Baek Cheol, this medal is worth 2 years of his life, which he won’t have to spend in the Korean military as he will be exempt as an Asian Games gold medallist. This will be the end of the road for both Lee Hyo Jung and Lee Kyung Won, who had announced to Badzine already she was to quit after Guangzhou. For Zhao Yunlei, it was all about going back to work. “We didn’t play well today. We’ll have to look it all over again and see what we did wrong so that we can progress,” said Zhao.